Model FC2002HBP6 is equipped with wheels and an extra-large 6 gallon tank. 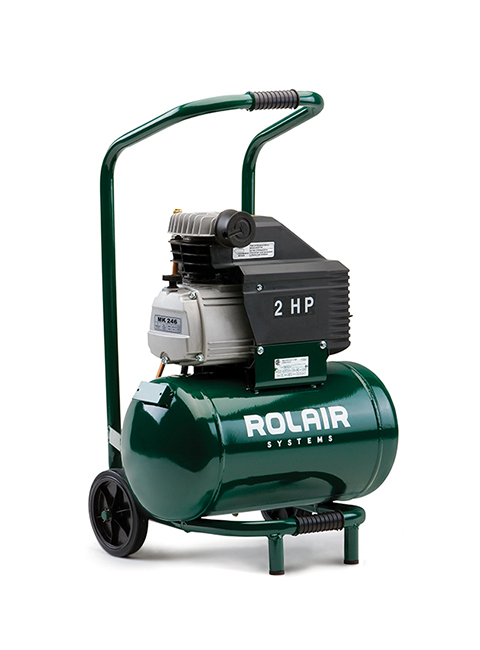 This low-amp draw 2 HP air compressor delivers 4.1 CFM @ 90 PSI. Motor features also include manual-overload protection for longer life and ball bearings for greater durability. ROLAIR Quality, Single Stage, Ball Bearings, Cast-Iron Cylinder, Stainless Steel Reed Valves and Splash Lubrication Ensure Longer Life. L x W x H 16"x14"x31"